Things You Should Know if You're Trying to Sell Real Estate "By Owner"
The fact is, it is tough to sell real estate by owner. Only a small percentage of sellers who list their homes by owner are able to sell by themselves. For sale by owner homes are not part of “the network” and don’t get nearly the exposure homes listed with real estate agents get. More difficult to find the homes for sale – It’s hard for buyers to find out about FSBO properties for sale as they’re not easily sorted and filtered and found on the MLS and on top Utah homes for sale websites. Nearly every home buyer begins their home search online at sites like NorthernUtahHomeSearch.com or UtahCornerstone.com that easily allow buyers to view all the MLS listed homes for sale. 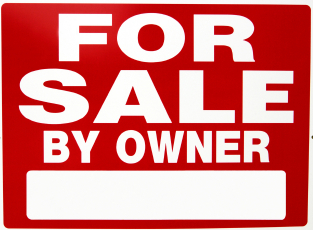 Most for sale by owner homes are non existent to potential buyers. More difficult to arrange showings – It’s much more difficult to get hold of the sellers directly than Real Estate agents who answer calls and show homes for a living. When sellers are finally, and actually contacted they need to coordinate their schedules to come up with an convenient viewing time for both buyer and seller. In contrast, when a potential buyer arranges to see homes for sale with a Realtor, they simply need to tell their agent the time they want to see homes, and the list of homes they need to see. Working with a buyers agent, buyers can see dozens of homes in just a few hours. Uncomfortable Showing Experience – When viewing for sale by owner homes, the seller is almost always present. This creates an uncomfortable and awkward situation for buyers who would much prefer having the privacy to view the home at their own leisure, in an environment where they can share their honest opinions about the home’s features. When the seller isn’t present buyers don’t have to worry about offending the seller who may be emotionally attached to their home. When viewing listed homes, sellers are instructed to leave the home and buyers are escorted by their buyers agents, who represent them. Uncertainty of how to handle the transaction – Most buyers, especially first time home buyers, have no idea how to write up an offer, let alone get the purchase transaction started. It is especially unknown to buyers how to account for issues like: how to handle earnest money, how to include contingencies, what to do about due diligence, home inspections, repairs, and how to protect themselves from financing and appraisal issues. Uncertainty of handling complications that arise – What happens after the home inspection is completed and the inspector recommends repairs? What is the seller required to do? How do you go about getting repairs done? What happens if the lender is unable to perform and the mortgage won’t be ready by the set deadline? 1. For Sale by Owner homes must be priced less than market value– Selling by owner is a huge disadvantage in terms of marketing exposure. Buyers aren’t going to go about the extra work of finding a home, unless they are going to be rewarded by a discount in price. 2. FSBO sellers need to be flexible with the price – For sale by owner sellers should make sure the advertised price allows room to pay for a buyers agent commission/and or closing costs. When home buyers begin the search, they almost always begin by using a real estate agent. Most homes for sale in Utah are listed by real estate agents, and chances are that a listed home will be the one they eventually buy. When buyers begin working with real estate agents, they sign a “buyers agency” agreement. Buyers don’t have to pay ANYTHING to their buyers agent if they buy a home that is listed on the MLS. If the home is not listed on the MLS, then the buyers must pay their agent a commission, typically 3%, if a FSBO seller is unwilling to pay their commission. Home buyers themselves almost Never have money themselves to pay their buyers agent a 3% commission. They usually need every penny they have saved to go towards down payment and closing costs. So, if for sale by owners aren’t willing to pay a 3% commission, then they have essentially eliminated 90% of the potential home buyers who can actually find their home that is for sale. This last week I helped a potential buyer look at a for sale by owner home. Before viewing the home, we asked the potential seller if they would be willing to pay an agent commission. They said they would, and I ended up showing them the house for sale. The buyers really liked the house, and were ready to make a FULL PRICE offer. When we talked to the sellers again, they said they would only pay a lower agent commission, and that the commission would have to be added on to the purchase price. When the buyers heard this, they decided to back off. The FSBO sellers waffling cost them the deal of represented, qualified, home buyers. Had the home been priced a couple thousand more, and had they been willing to pay the buyer agents commission, this house would likely be under contract today.